In order to stop, you have to use your brakes effectively. Most new vehicles have an Antilock Braking System (ABS) which will allow you to stop without skidding. Consult the vehicle owner’s manual for how to use the ABS. Press on the brake pedal as hard as you can and keep pressing on it firmly. Apply the brakes as hard as you can without locking them. You can cause the vehicle to go into a skid if you brake too hard. If the brakes lock-up, you will feel the vehicle start to skid. Quickly let up on the brake pedal. As soon as the vehicle stops skidding, push down on the brake pedal again. Keep doing this until the vehicle has stopped. In case of brake failure, pump the brake pedal quickly. In most cases, you can turn the vehicle to avoid a collision quicker than you can stop it. When you don’t have enough room to stop, you may have to steer away from what’s ahead. It’s very important, however, not to oversteer, which may increase risk of skidding or rollovers. Do not apply the brake while you are turning. It’s very easy to lock your wheels while turning. If that happens, you may skid out of control or cause too much weight transfer and rollover. Be prepared to countersteer—that is, to turn the wheel back in the other direction, once you’ve passed whatever was in your path. Keep both hands on the steering wheel. 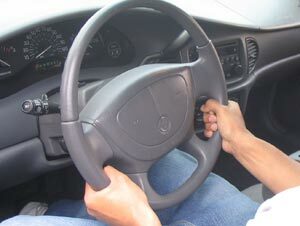 In order to turn quickly, you must have a firm grip on the steering wheel with both hands. It is best to have your hands at the 4 o’clock and 8 o’clock positions. This will keep your wrists and forearms out of the main impact area of the air bag, reduce weight transfer, and is generally more comfortable. Sometimes it is necessary to speed up to avoid or lessen impact forces in a collision. This may happen when another vehicle is about to hit you from the side or from behind and there is room to the front of your vehicle to lessen or change the impact area. Be sure to slow down once the danger has passed. Always, try to maintain a safe following distance from the vehicle ahead and position yourself to see the bigger picture.